An acceptable use of white walls? I love the bit in the Pixar film "Cars" when he's being sold whitewalls by the little Fiat 500 tyre dealer. Not in my view! Tyres should be black or they look wrong to me. I suppose latex rubber is white but thats not the point. For you is there EVER a place for a white wall? An American Midget racer? No, not even then! My Augusta had white wall tyres when I bought it, but I soon painted them black. I also bought some for the Lambda because they were so inexpensive, but again I painted them black. My Kurtis has always had black wall tyres, thank goodness. Definitely! 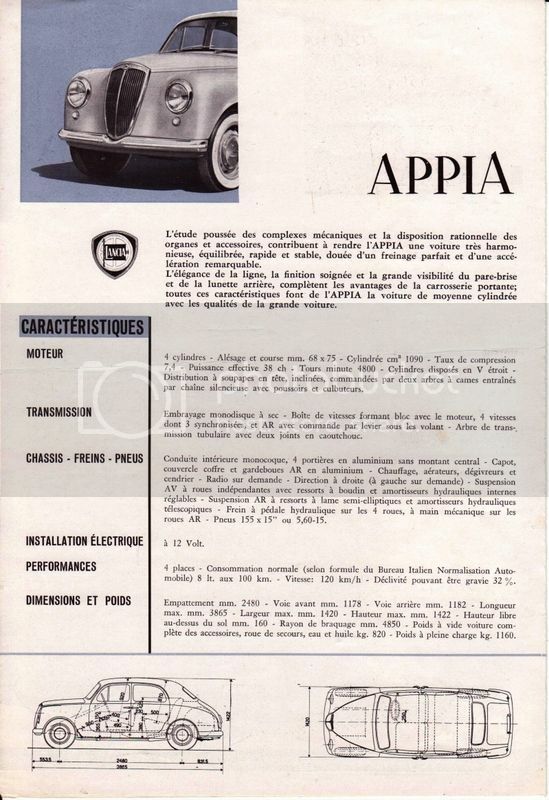 Period correct for Appias - they were even a factory-fit option when the cars were new. They were listed as one of the items in the 'Quattroruote' road test - see attachments. If you're not too up on Italian, the words you are looking for are 'gomme fianco bianco', and they were a snip at 9000 lire (or you could have blackwall X's for 15000). Both my S1s had them fitted (and the 'new' one still has them fitted), either from new or very shortly afterwards (both came with Michelin Pilote CROSSPLY whitewalls, and it is a good while since Michelin sold crossplies. As both cars (coincidentally) had been taken off the road in 1976 and the tyres were very old by then I estimate them to have been fitted no later than the early 60s). So yes - exactly the right look for an Appia! I think it's grigio chiaro (pale grey), although in a black and white photo it's hard to tell. It could be white but dirty. These'll have you spluttering into your porridge then! As has been pointed out, latex is white, and a lot of very early tyres were all-white with no black at all. I took this pic at Hershey in 2011 - the car is a bit over-restored for my tastes, but the pic shows some all-white tyres on a very early (brass-era) Model T.
I realise that many people do like them, but not me. In pictures, I tend to like the lower part to be dark, rather than light, as that usually improves the composition. Perhaps that's why I think tyres look better black. I don't like shadows going upwards either, as lighting should normally be from above. When photographing small items in the studio, I was always encouraged to "sit the item on its shadow" - and I think it usually looks better for it. White wall tyres are particularly popular in America - and they are welcome to them. In my view it depends how 'bling' a car is. I would agree that an Augusta (and especially a Lambda) would look a bit silly with them. However, that's largely because they are 'out of period' for the car. Modern low-profile radials on an Appia would look just as terrible as whitewalls on a Lambda, as older tyres had much deeper sidewalls. You'd be surprised how many tyre specialists manage to palm them off on unsuspecting buyers, though. My 37 Terraplane looks good with them (IMHO), although they were only just coming in when the car was built, and weren't very widespread. And a 59 Cadillac would look silly without them (but I guess you'd probably say a 59 Cadillac just looked silly, period...). I had always thought they were too bling for S1 Appias till I saw the photo I posted above, but I think they really 'work' on that white car, and they look good on gold S3s. I have a strong feeling that that's the same car as in my pic above - I have several brochures, including this one, with what appears to be that car in! Here is another one, seen at Sliding Pillar 2013 in Sedan. Not so good on dark colors in my opinion!